In 1978 the Short Course Committee decided to forego activities because the annual meeting of the M.S.A. was held together with the Mineralogical Association of Canada, who sponsored a Short Course in Uranium Deposits and published a book by the same title. 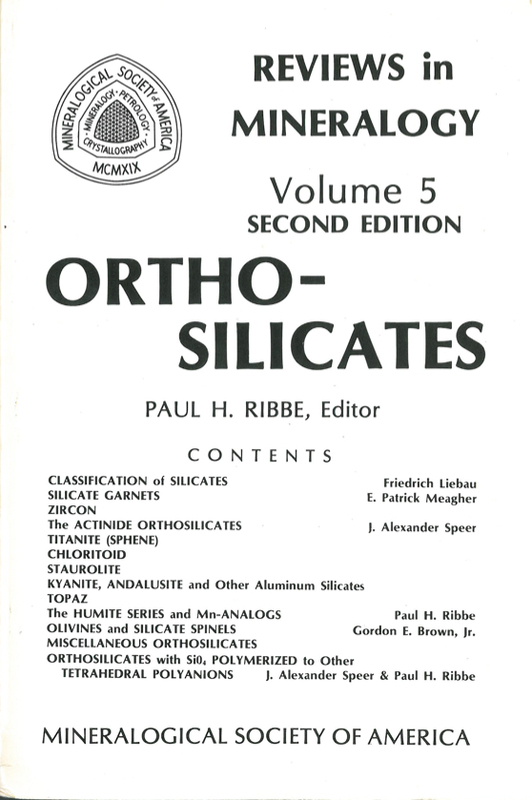 A number of mineralogists expressed regret at the potential loss of momentum in MSA's production of this series and encouraged several authors of this book to press on with their idea of publishing Volume 5 -- Orthosilicates. Work was begun in 1978; however, without the pressure of a deadline associated with presenting the material to students of a short course at the annual meeting, procrastination set in and the first edition of this volume was not completed until September 1980 (with the exception of Chapters 1 and 2 which were submitted in their present form in 1978). In the meantime Volume 6, Marine Minerals, appeared in time for the annual meeting of the Society and a Short Course in San Diego in November 1979. In 1980 the Council of the MSA changed the name of the published volumes from SHORT COURSE NOTES to REVIEWS in MINERALOGY in order to more aptly describe the material contained in this now highly successful series. The First Edition of Orthosilicates was the first volume to appear under the REVIEWS banner. This is the Second Edition of Orthosilicates. It contains an updating and minor revisions of Chapters 3 through 10 (only) and two new chapters originally intended for the First Edition. The intent of this volume is to emphasize the crystal chemistry and related physical properties of the major rock-forming orthosilicates. Though in some chapters more attention is given to phase equilibria and paragenesis than in others, these are for the most part cursorily treated with references to the more important papers and to review articles (also see Deer, Howie and Zussman, 1962, Rock-forming Minerals, Vol. 1, Ortho- and Ring Silicates). Some confusion will inevitably result from the definition of the term used as the title for this volume. In Chapter 1 Liebau (p. 14) says that "silicates containing (SiO4) groups should be called monosilicates rather than orthosilicates or nesosilicates." The editor chose not to adopt Liebau's terminology for the title, because monosilicate is not yet widely accepted (although it might well be). To set manageable boundaries for the scope of the First Edition of Orthosilicates, an editorial option was exercised in rejecting as "orthosilicates" those minerals with both (SiO4) tetrahedra and (Si2O7) groups (zoisite, epidote, vesuvianite, etc. ), as well as those with (SiO4) tetrahedra that are polymerized to other tetrahedra by sharing corners with (BeO4), (BO4), (A1O4), (ZnO4), etc. However, as mentioned in the Foreword, Chapter 13 has been added to the Second Edition to correct for the latter omission. Chapter 12 contains very brief descriptions of the paragenesis and crystal chemistry of many orthosilicates that fit the description stated in the Preface (p. iv). It may be used as an index, because all orthosilicates are listed alphabetically, including those discussed in Chapters 2 through 11.